This week was a challenge. 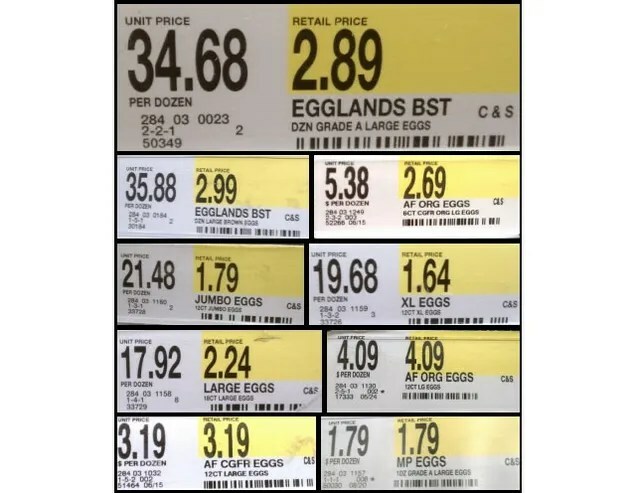 There are a lot of close prices, and not just in the ongoing Apple Wars arena–blackberries (99c/Sprouts, 97c/HEB and 5.6 oz v 6 oz), and potatoes (do we care about 33c vs. 25.8c/lb?) were both places I had to stop and think. I’d initially planned on a straight-up cheapest wins, in Cheepie world. But if it’s just a cent or two, I feel like you need to know that the other low price is there. If you’re only going to one store this week, I want you to know that the blackberries are on sale at HEB and Sprouts. In other areas, I’m making a call. I waffled on the loin chops at Fiesta–that’s an okay price. Normally, I stock up on pork loin when it’s $1.99/lb. But I haven’t seen it at that price in a while, and while I’m happy to slice a whole loin into chops not everyone is, so I went ahead and listed it. Then there was the pricing nonsense that is HEB/CM this week. They need to just make a call on kale and own it. This week HEB has organic kale for 97c/bunch, and non-organic for 98c/bunch. CM has organic kale for 88c/bunch. ‘Bunch’ is a terrible unit of measurement, and I am unhappy to have to deal with it at all. It’s possible the organic bunches are very stemmy, or smaller than others, it’s possible they’re all the same. I don’t know! And the point of this is for me to steer you right! And I don’t like kale! But tomorrow I’ll go check on this situation, and likely crab at some produce staffers and report back. ALL FOR YOU. AppleWars continue to be won by HEB with the Best Week Yet–organic Gala 88c/lb, and organic Honeycrisp, $1.48. This is a good bit cheaper than last week, and you can be certain I’m tracking this for next year, so I know when the real ‘lows’ are! This week, I thought about putting some of the Randalls ‘Just For U’ deals up, because the mailman brought my fliers today (thanks, you crazy pith-helmeted man!) and there were some good ones. Basically, you can fetch them online, or clip them out of your circular from the mail. Having to do that is contrary to my goal, which is just tell you which good food is on sale this week. I don’t want you to have to start clipping or signing up. If you’re in Randalls on a usual basis, I suggest you sign up for the J4U, and pay attention to the mailer–there’s cheese for $3.25/lb, and pasta sauce for $1.25. If you’re not, well, you and I both know there aren’t enough deals there for you to sign up double extra nonsense. But do get the club card and use that for the deals you can, or ask me for my number, and I’ll get gas points when you shop there. That has the added benefit of confusing their data, and I’m always a fan of chaos. Check in tomorrow for a stocking-up post, and don’t forget Saturday’s dinner score post! I’m very optimistic I’ll up last week’s score. Hello Cheepsters! Hope everyone had a good weekend, and you’re all ready for Halloween. It’s all over here except for the candy. Well, that and Tiny still changing her mind about what kind of vampire to be. Pink Vampire is currently winning. Here’s the plan for this week. Salmon is leftover from last week, sale items were: tomatoes, carrots, celery and chicken. Thur: Refrigerator Buffet! and Carrot Soup! Fri: Halloween! Pizza and candy for all! Here’s hoping I beat my current record of 5 points. …and we’re back to Scary Vampire. Or Pirate Vampire. Stay tuned! Mon: pork fried rice, spinach and feta salad, bananas, cucumber and celery sticks. 7:15 pm. people attending: 4. Score: 1 point. Tue: leftover posole, chicken and stars soup, wheat bread, spinach and feta salad, apples, avocado. Broccoli forgotten in microwave. 7:00 pm. people attending: 5. Score: 1.5 points. Wed: cheese pizza from the freezer, cucumber slices. 8:00pm. people attending: 2. Score: 0 points. Thur: broiled salmon, broccoli, blackberries, caesar salad, butter noodles, pesto, cucumber and carrots. 7:15 pm. people attending: 5. Score: 2 points. Fri: German food at Octoberfest. 7:00 pm. people attending: 3. Score: 0.5 points. Wednesday was clearly the problem day, but Thursday was a good recovery. My scoring system is arbitrary, invented on the spot each night when I wrote down what we’d had for dinner. I took one whole point off if everyone wasn’t present, and a half point off for missing a food group. Out of a possible 10 points, this week was a 5. A flunk! With a plan, good intentions and internet accountability, I still fail family dinner. Tomorrow is another day. Surely, next week will be better. Halloween can’t disrupt a whole week, right? RIGHT? This is the first post I’m going to start labeling with the (DD) and (C15) labels. I’m not sure if they’ll be helpful or not–I know I have my mental lines about what prices I’m going to pay and when I shop organic and not. I want to help people shopping for the best deals find the best deals for their purposes, whether organic or conventional. Let me know if you think this labeling is helpful, or confusing, or guilt inducing. Because I know I buy non-organic grapes all the time, and I can’t decide how guilty to feel! I also wish I could get the info below in a more columnal structure ( I just made up a useful word there!). For now, this is what I can do. This week, Randalls wins the Apple Wars at 69c/lb, but HEB wins the organic Apple Wars, at 98clb. HEB kind of manhandles this war. There we go. That’s the round-up. A pretty good week, still a lot of Apple Wars, and a decent amount of produce on sale at stocking up prices. I wish I knew what to tell you about those pork neckbones. I know I’ve bought them, but I think that was a freezer to trash event. If you’ve got a use for them, let me know! As a last note, I’d add that Randalls is having a $5 Friday special, for an 8 stem rose bouquet. If you’re in a Randalls on Friday, I can’t think of a reason not to pick one up and give it to someone–for that price you might buy two and make the day for two people! You don’t need a reason at that price, it’s just because you’re happy it’s Friday!